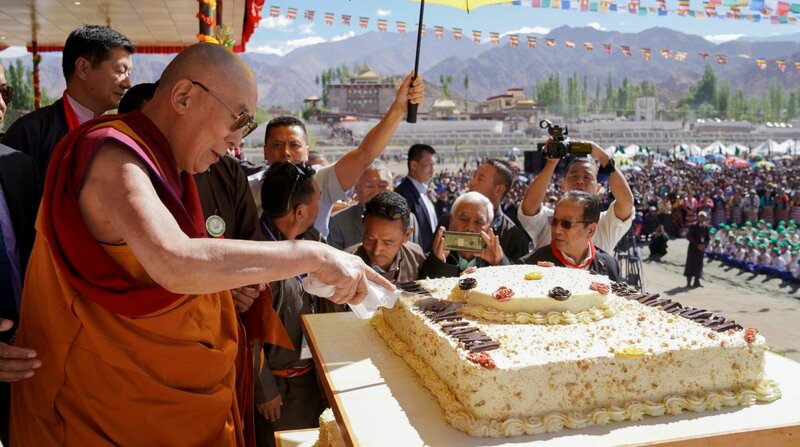 Special prayers were held in Leh for the Tibetan spiritual and temporal leader Dalai Lama who celebrated his 83rd birthday on Friday. A large number of local residents gathered for a special ceremony at the Shiwatsel Teaching Ground to be blessed by the Dalai Lama as he cut the cake. Dalai Lama had reached Leh earlier this week to celebrate his birthday. He would stay here till July end and deliver sermons to the people. Revered by the Buddhists as a living god – an incarnation Avalokiteśvara, people in traditional attire prayed for good health and long life of the spiritual leader who fled to India in 1959 to escape persecution in China. Lobsang Sangay, the Prime Minister of the Tibetan government in exile, also reached Leh to participate in Dalai Lama’s birthday celebrations. Dalai Lama has special affection for the people of Ladakh and this is his second visit to Leh in the past few months. On his arrival on Tuesday, Dalai Lama said that people of Ladakh have a special bond with him.